Successfully Added Car Karaoke Machine - 2x Wireless Microphone, Bluetooth 3.0, 1050mAh Battery, Echo Mixer, MCU Chipset to your Shopping Cart. This car karaoke machine is the ultimate car gadget to bring along on your upcoming holidays and camping trips. 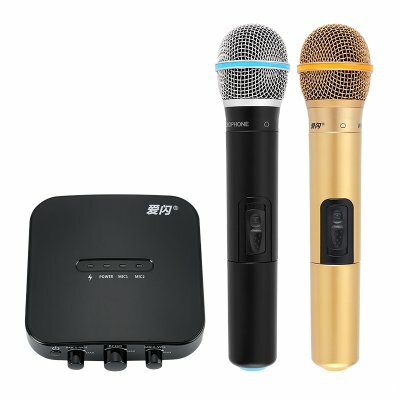 Perfect for in your RV, caravan, or regular car – this karaoke machine lets you and your friend sing the night away no matter where you are. It comes with a 1050mAh battery that allows you to use it for up to 10 hours continuously. You’ll always have enough juice to get through the longest of music filled nights. The next time you go out on a road trip or head into the wild to camp, you’ll never again have to wonder what to do at night. This car karaoke machine will keep you and your loved ones entertained for weeks to come. With its two wireless microphones, this portable karaoke machine brings along great usability. You will be able to either use it alone or to sing a beautiful duet with one of your friends. The volume of the microphones can be manually adjusted. They are powered by two regular AA batteries (not included) so you’ll be able to easily replace your cells once they have run out of juice. By supporting Bluetooth 3.0, your car karaoke machine brings along great data transfer speeds, ensuring that you’ll never encounter any lag or delay. This car gadget comes with different echo and sound effects to provide you with a professional-grade music experience. Thanks to this, you’ll be able to enjoy great sound quality and pure tones anytime you or your friends start singing. This car accessory comes with a 12 months warranty, brought to you by the leader in electronic devices as well as wholesale electronic gadgets..
Arabic: - سيارة كاريوكي آلة - Chinese Simplified: - 汽车卡拉 Ok 机 - Czech: - Auto Karaoke stroj - Danish: - Bil Karaoke maskine - Dutch: - Auto Karaoke-Machine - French: - Machine de Karaoke de voiture - German: - Auto-Karaoke-Maschine - Hebrew: - מכונת הקריוקי המכונית - Hindi: - कार कराओके मशीन - Italian: - Macchina di Karaoke - Japanese: - 車カラオケ マシン - Korean: - 차 노래방 기계 - Malay: - Mesin Karaoke Kereta - Norwegian Bokmål: - Bil Karaoke maskin - Romanian: - Maşină de Karaoke maşină - Russian: - Автомобиль-Караоке - Spanish: - Máquina de Karaoke de coche - Thai: - เครื่องคาราโอเกะรถ - Turkish: - Araba Karaoke makinesi - Vietnamese: - Xe máy Karaoke.